Mast flat and more central. You would slide it into this position for maximum horizontal support. A couple of Red FFHVK easels in front of the easels on the left. The red easels are made from Jarrah and Karri. This is my latest easel, made from a mixture of Karri and Jarrah, and the last painting I did. The tray is an old prototype in Vic Ash I now use. I regularly sell my personal easels, when I run out of stock. 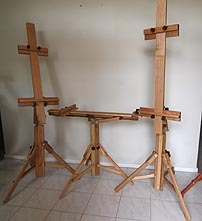 Two folded easels, a FFHHV on the left and a FFHHVM on the right. An earlier design, before I came up with the single mast. FFHVX special easel, made from Red Australian Hardwoods. This was an extra heavy duty model and was ordered with a Non Tilting Tray and Palette Holder. Normally you would not put a non tilting tray on a Horizontal to Vertical easel as it can only be used with the easel in the vertical mode. Easel weighs 25 kilos and is 2 metres tall.